- until 30th June 2020 - plus other acknowledgements, where ever possible. 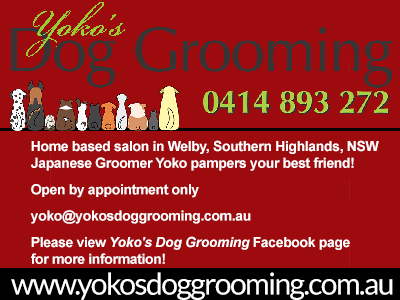 Many thanks to Yoko's Dog Grooming for her generous support of our 3rd Annual Robertson Railway Waratah Dogwalk! ​for giving us a very large number of dog treat and dog shampoo samples. Other Sponsorship: We would also welcome offers of free medical checks or other services / products as prizes for those dogs that do the walk.